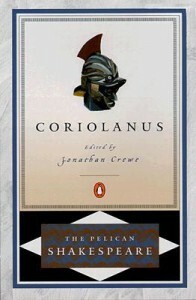 In anticipation of the release of a new filmed version of Coriolanus, I reread the play in Dec 2011. It remains a difficult play to enjoy, and I'm going to retain my 2-star rating - it's OK compared to other Shakespeare plays. The protagonist is an arrogant, spoiled, immature patrician whose disgust for Rome's plebeians is so manifest and violent that his enemies easily manipulate the citizens into banishing him. He flies to his chief enemy, Tullus Aufidius, the leader of the Volsces, and returns to Rome at the head of an invading army. Coriolanus' enemies suffer for being relatively pale and forgettable. 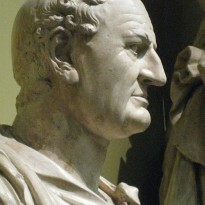 In Rome, the cynical manipulators of the rabble are the tribunes Sicinius Velutus and Junius Brutus; and Tullus is a coldly pragmatic politician, not a charismatic villain like Iago (Othello or Aaron (Titus Andronicus) (as Marjorie Garber notes in Shakespeare After All, comparing him to the Octavian of Julius Caesar and Antony and Cleopatra). Another reviewer has pointed out another problem with the play and that's its unrelenting grimness. I recently watched an Othello performed at the Globe Theater in 2008 where the importance of humor (even if dark) was showcased in the performance of Othello's servant and the hapless naivite of Roderigo. There are a few scenes that could be milked for laughs (in particular I'm thinking of Act IV, sc. 6, when the citizens are falling all over themselves saying how they really didn't mean to banish Coriolanus) but they are few.